Pervious Concrete - Pave Ahead. All rights reserved. The best choice for you - and the environment. Meet government standards. Pervious concrete is an open-graded system that allows stormwater to pass through it, allowing it to seep into the ground. A safer choice. Air circulates beneath pervious concrete, accelerating the melting of snow and ice. Drier pavement also reduces the risk of refreeze. Easy Care. 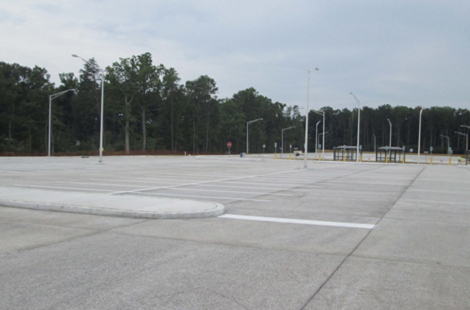 Parking areas paved with pervious concrete are designed and constructed to last 20 to 40 years only requiring minimal annual maintenance to remove debris. Save some coin. Parking lot owners that choose pervious spend less money on the labor, construction, and maintenance of detention ponds and other stormwater management systems. Scope of Work: Pervious concrete, reinforced concrete, sidewalk, curb and gutter. Benefits: Pervious concrete protects Chesapeake Bay Watershed by preventing groundwater runoff. Check out these resources for engineers and owners. We’ve also got additional guidance on how you can maximize the drainage properties of pervious concrete in your next project. .